As Juliana and I emphasized during a presentation at last year's MobileActive conference in South Africa, just because over three billion people are equipped with cell phones, which can be used as tools for reporting during emergencies, that doesn't mean the world has three billion citizen journalists ready and able to cover every natural disaster, political uprising, and news-worthy event they encounter. The recent coverage of Tropical Storm Eric, Cyclone Fanele, and the ongoing protests and political turmoil in Madagascar by local citizen journalists reveals the importance of 1.) citizen journalism training programs, 2.) the translation and contextualization of local content for a global audience, and 3.) networks of media groups so that local voices can be amplified and understood when breaking news hits. In the case of Tropical Storm Eric and Cyclone Fanele, which last week battered Madgascar's east and southwest coasts respectively, local bloggers filled the void left by the official Department of Risk and Disaster Management's complete lack of web presence. Cyclones are an annual issue for residents of Madagascar and, as local blogger Lomelle notes, while they can't be stopped, disaster preparedness can certainly improve. She photographed an evacuation exercise in the capital city, Antananarivo, as a model of how other cities and villages around the country can better prevent injuries and deaths when cyclones hit. Lomelle, a student at the Mahajanka school of journalism and a fan of slam poetry, learned how to upload photos to the web and maintain a blog during a series of workshops hosted by Foko Madagascar, a Rising Voices grantee project. Foko aims to bring more of the world's attention to the Malagasy people – rather than just lemurs and Disney films – by training Malagasy citizens how to use citizen media to portray their daily realities and connect to the online global conversation. 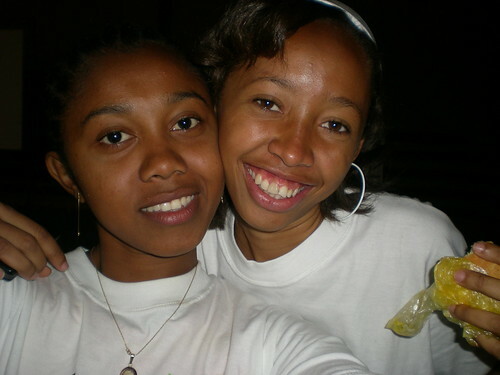 Foko Madagascar bloggers Diana and Lomelle at last year's E-bit conference. December 2007: Municipal elections in Antananarivo lost by governing party against a young self-made businessman, not unlike the current president. November 2008: Prospective land deal with Daewoo Logistics draws outrage nationally. December 2008: Conflict over the alleged improper broadcasting of political speech and its unsuing closing of the broadcasting television station. January 2009: Series of unusal prison Breaks all over the nation. January 2009: As tropical storms hit Madagascar, political demonstrations against government expand. In a cruel twist of irony, the regions hit by storms are also the ones closely involved in the prospective land deal. 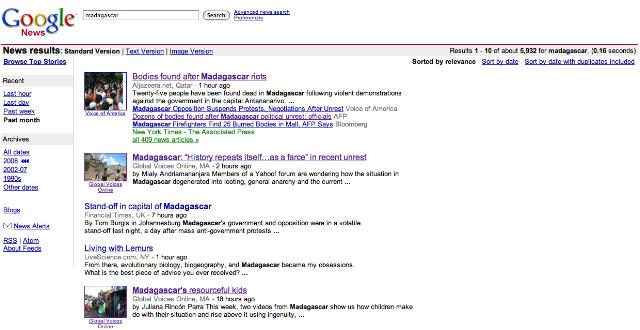 As consumers of media it is important for us to recognize that Madagascar is rarely mentioned in major media outlets like the New York Times unless the article is about social unrest or the death toll following a cyclone. Madagascar, like other African nations, is much more than just a disaster story and the Foko Bloggers, in addition to proving themselves worthy citizen journalists during tumultuous times, have also spent much of the past two years painting a more holistic portrait of their country. Juliana Rincón, who is involved in the HiperBarrio project in Medellín, Colombia, points to three different videos made by Foko Madagascar participants which show a side of life in Madagascar that most of us would otherwise never see. Koloina, who focuses on Malagasy culture, shows the ingenuity of 11-year-old Toky and his recycled aluminum car toys. It has been 3 years now that, every evening after work, I have met this young guy singing on the stairs of Antaninarenina. It has been 3 years now that I am used to give him money ’cause he is so cute with his little guitar and his gospel songs. Today, I decided to talk to him and asked him a few questions. He smiled and looked down and finally agreed. I told him that I would talk about him on my blog and English Corner page so people who will meet him will recognize him and, maybe, will be nicer to him. That’s a very good point Joan. Safety is much more important. Citizen journalism is a good initiative that requires both financial and human resource support b governments and development actors. Training recognised humanitarian groups like The Croix Rouge Malagasy can be a good way to put citizen journalism to effective use as these people once identified are usually allowed to be present in emergency situations, street demonstrations, fire accidents, disasters and they can produce very good images. I worked with the Croix Rouge Malgache (Malagasy Red Cross) in 2006 and was impressed by their efforts.